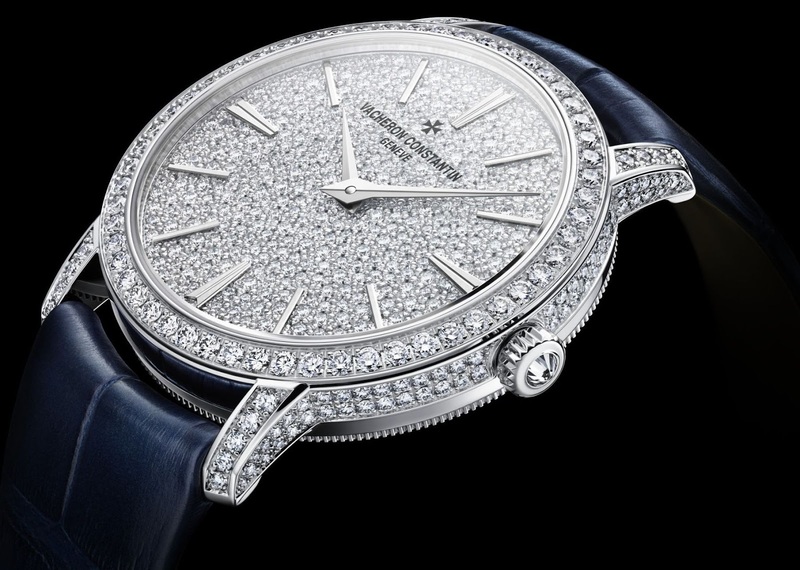 After having launched a 38 mm-diameter version of Traditionnelle Model in 2013, Vacheron Constantin unveils a sparkling and daintily feminine 33 mm-diameter version entirely paved with several hundred round-cut diamonds. Beneath the sparkling elegance of the snow-set dial beats hand-wound Calibre 1400 bearing the prestigious Hallmark of Geneva. In a spectacular display of working with light, the gem-setter has opted to alternate between two different gem-setting techniques to play on various sparkling and shining effects according to the surfaces to be lit up. The bezel and sides of the 18-carat white gold case are paved with 196 grain-set diamonds, while 394 diamonds shimmer intensely on the dial thanks to the magic of the snow setting. The subtly random reflections of this clever gem-setting contribute to a glowing visual effect achieved by juxtaposing precious stones of varying sizes so as to entirely cover the underlying gold surface. Perfectly moulding the rounded curves of the case, the 608 precious stones completely carpet the watch, while a 0.06-carat round-cut diamond appears like a punctuation mark on the fluted winding crown. 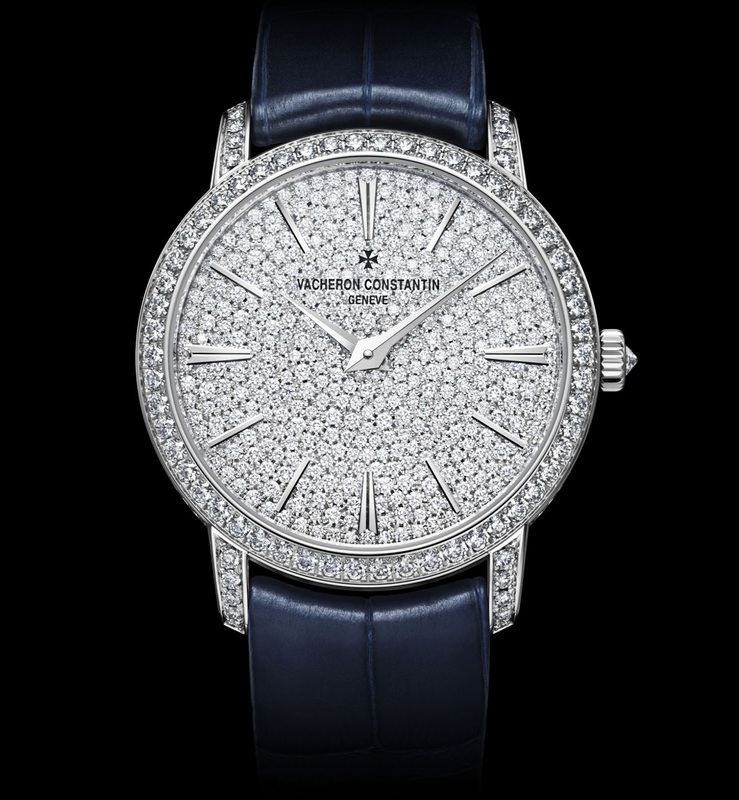 A night blue Mississippiensis alligator leather strap creates a striking contrast that further enhances the luminous beauty of the diamonds. It is adorned with an 18-carat white gold pin buckle set with 17 round-cut diamonds. The sapphire crystal caseback reveals hand-wound Calibre 1400. Developed and crafted by Vacheron Constantin in keeping with the finest Haute Horlogerie traditions, it meets the demands laid down by the famous Hallmark of Geneva that applies to the finished watch. This movement beats at a frequency of 4Hz (28,800 vibrations per hour) and ensures a 40-hour power reserve. Its finishing as well as its design testify to superlative craftsmanship: not only do the main smooth surfaces of the movement bear a traditional Côtes de Genève motif, but their sharp edges are also finely chamfered before being hand-polished, as are the flat-head screws.